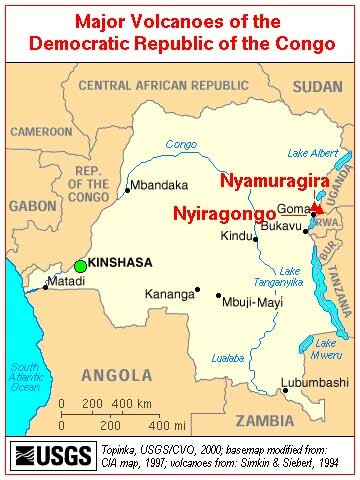 The Nyiragongo volcano in eastern Congo began erupting on Jan. 17 with lava flows burning their way through towns and villages on Jan. 18, killing an estimated 45 people. Hundreds of thousands of people are fleeing across the border into Rwanda. News reports say a 35- to 70-meter swath of lava, at some places 2 meters high, advanced through the city of Gomo and poured into Lake Kivu. Gomo has a population of 400,000. Many people have evacuated by foot. 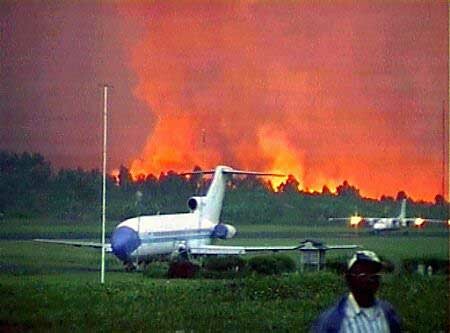 Reuters TV image: A fire rages near the Goma, Congo, airport Jan. 17, as a plane takes off following the eruption of the Nyiragongo volcano, six miles from the town center of Goma. A river of molten rock poured from the volcano a day after it erupted — killing dozens, swallowing buildings and forcing hundreds of thousands to flee the town of Goma.